If you are an American citizen, or even a foreign national from a different country, there can be several different reasons why you may be refused entry at the Canadian port of entry. In almost all cases, the reason for refusal resolves around inadmissibility. Inadmissibility can either be criminal, medical, financial, for security reasons and more. It is important to recognize that the Immigration officer has the authority to refuse your entry, even if you have a criminal conviction from over thirty years ago. Thus, it is very important to determine whether you are admissible or not. Therefore, in this article, I will address the major reason why you can be refused entry at the Canadian port of entry and other important information you should know if you are criminally inadmissible. Due to Immigration officers being vigilant about who enters Canada and their intentions for entry into Canada, foreign nationals, especially Americans, who attend to cross the Canadian border or enter Canada at their port of entry with a criminal record, are most often refused entry into Canada. The reason for their vigilance is to ensure that Canadian citizens, permanent residents, and any visitors in Canada, are safe and secure from any threats or risks. Therefore, if you have a minor or major offence on your criminal record, it is not advisable to attempt to enter Canada without proper authorization. The authorization that you should obtain prior to travelling to Canada can be either a Temporary Resident Permit or a Criminal Rehabilitation application. It is worth mentioning that a Temporary Resident Permit can be applied for at the port of entry; whereas, the Criminal Rehabilitation application must be submitted to the Canadian Consulate. If you have successfully dismissed or expunged your charge in your country of origin or residence, it is important to know that this may not translate into Canada. If you have a past charge from a foreign country and have not overcome your criminal record in Canada, you will be refused entry into Canada. You must ensure you take care of your criminal inadmissibility in Canada in addition to your country of origin or residence. Depending on the offence you had, this will ultimately determine which application you should apply for and how long you must wait before applying. 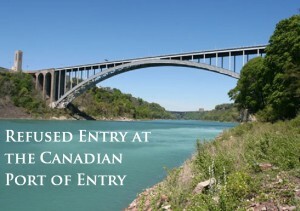 It is essential that you have taken all the aforementioned information into consideration if you are attempting to enter Canada through the port of entry with inadmissibility issues. If you would like to apply for either a Temporary Resident Permit or a Criminal Rehabilitation, it is essential to note that these are difficult applications to pursue on your own. Therefore, it is highly recommended that you seek out professional and experienced help prior to submitting the application. Here, at Akrami & Associates, we work and have experience with many different immigration matters. We have helped many of our clients create strong Temporary Resident Permit and Criminal Rehabilitation applications. If you believe that you may be eligible to apply, please feel free to contact Akrami & Associates at our office at 416-477-2545 for more information or if you would like to book a consultation with an immigration professional for more advice. At Akrami & Associates, there is always a way!